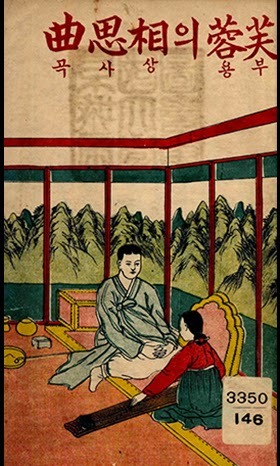 At last, here's the final installment of my February special project aka My Adventures with the Mysterious Hanbang (한방) Buyonghwa Jeonghyo set. It's been a crazy month, with hours spent every day working on this project: transcribing, translating, researching, slamming my head on my desk, and drinking copious amounts of fermented Vitis vinifera. The flash of my camera got realllly excited here. Maybe it liked the shiny lids? I have mixed feelings about the end of this project; on the one hand, I am sad that I will no longer be using this gorgeously-packaged set (I'm keeping the jars, but will be decanting some for friends and family to try, so the leftover product will not go to waste), but on the other hand, I'm eager to get back to an unrestricted, customized skincare routine tailored to my skin's problem areas. For someone who is accustomed to having a wide range of products to choose from on a daily basis, depending on how my skin feels that day, it was definitely a little stifling to limit myself to a single line. That being said, it was very novel to try a full line that was designed to be used together and it's something I've always wanted to try! 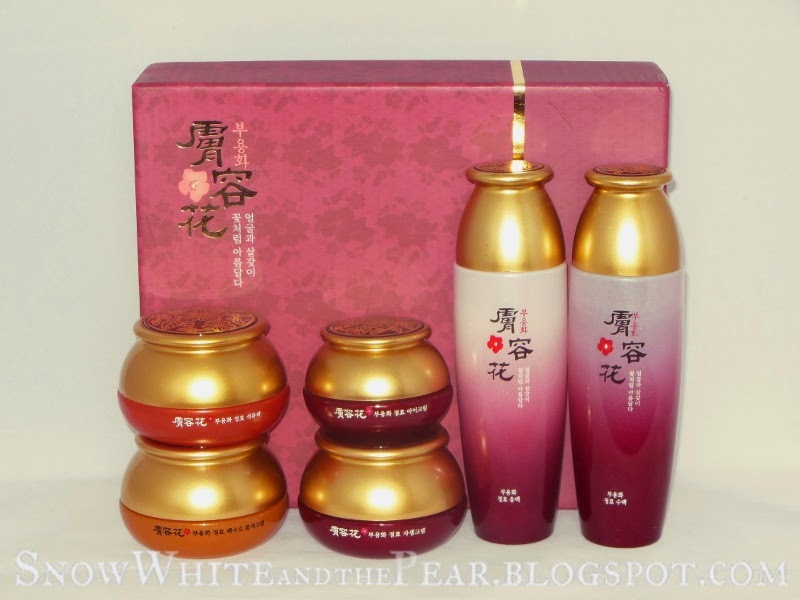 If you haven't been following the weekly updates, here's a quick recap: I ordered this beautiful Hanbang (traditional Korean herbal medicine) set during a holiday flash sale on a Korean website. It's not available through any of the usual international channels, and I used Avecko's buying service (post here) to acquire it. I then decided I'd do an experiment for the month of February and use just the set as my hydrating steps, translating and researching as I go, as I don't know Korean. And now here we are with the final post! It's nicely hydrating, sinks quickly into the skin, and gives a refreshing, moist feeling. It's not sticky and I can use a pretty generous amount without feeling like I'm building up residue on my skin. I would actually like this quite a bit, enough to keep using it for a while until I have something else I want to use instead, if it wasn't for the scent. It's heavily, heavily fragranced. 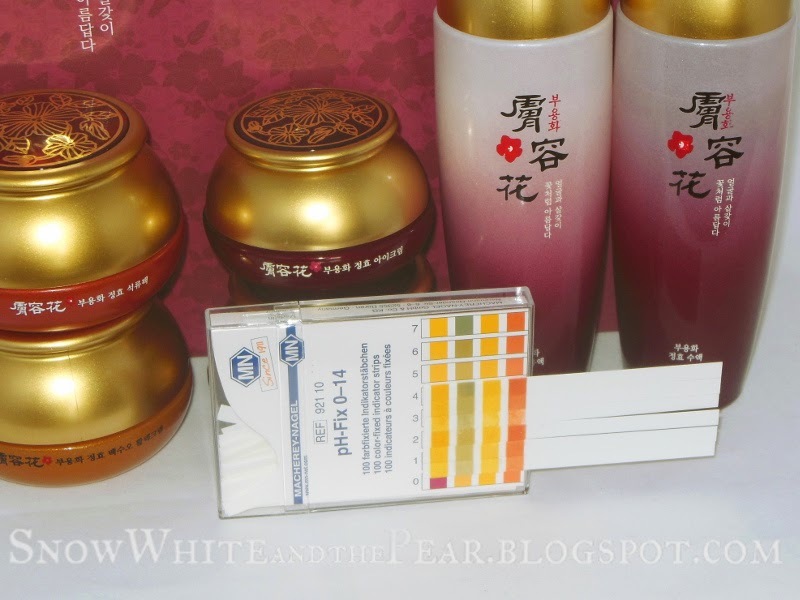 I have noticed this is a common issue with Korean toners in my experience; sometimes I feel like I'm patting perfume onto my face, and not in a good way. It's got a sort of chemically-floral scent rather than a genuine floral scent, which I don't like. The Sap is a whopping 140ml and comes in a nicely heavy glass bottle with a thick bottom that prevents it from being unbalanced and therefore in danger of tipping over. Despite liberal use of this x2 a day, I've barely made a dent in this. The lotion (hilariously mistranslated by Google as 'latex') is a thick, runny emulsion which is applied after the Sap. This is my least favourite product of the bunch, mostly because I have intensely combination skin which is also dehydrated, so it really doesn't suit my skin type. My skin responds best when I use different products in separate areas. I have to use it very, very sparingly in my oily areas and then load up other layers in my dry areas. This might work for someone who has very dry skin and needs a lot of emollient type products in layers. It has a similar floral fragrance as the Sap, but not nearly as strong. It has a very strange consistency which makes controlling how much you dispense a challenge. At first, it seems too thick to flow out of the mouth of the jar, requiring you to upend it at a 45 degree angle and whack the mouth of the bottle against your palm to get it out. Then, once it finally comes out, it doesn't stop, flowing rapidly in a strangely stringy way that reminds me of pouring latex house paint. Ironic, considering Google's translation of it! 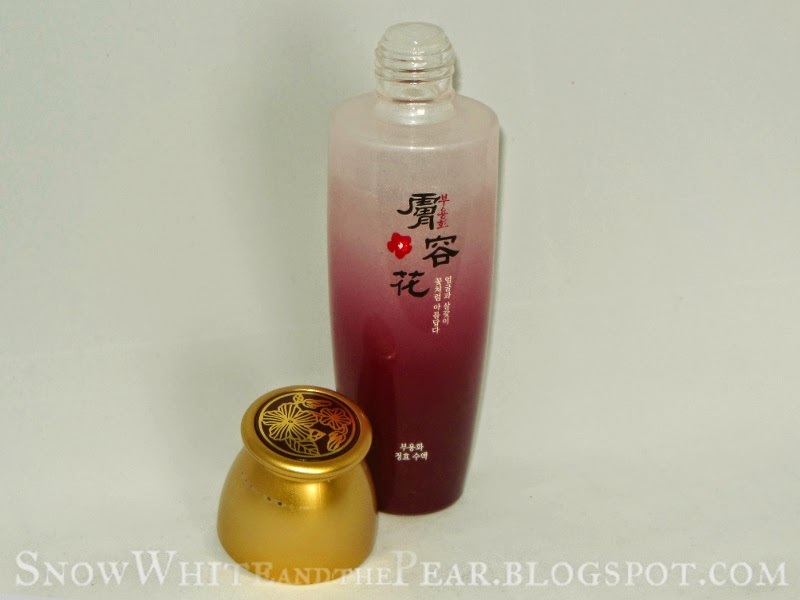 It's in the same type of bottle and 140ml volume as the Sap, just a slightly different colour/pattern and more opaque. 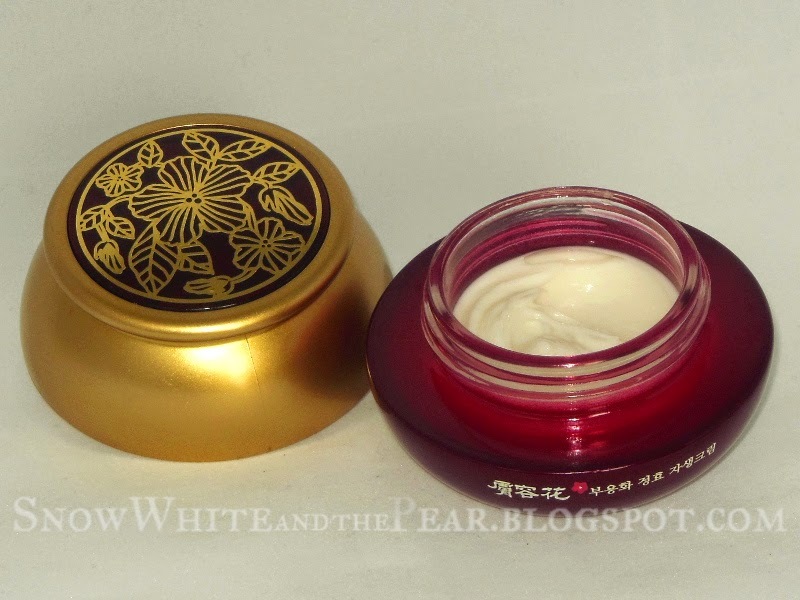 The eye cream is pictured here with the Wild herb/flower cream for scale, as the jar is 30g compared to the 50g of the other jars. It's standard for eye creams to be smaller volumes anyway, as you apply so little product. The scent is a pleasant combination of flowers and herbs, and doesn't have a strong 'floral fragrance' artificial scent like the Sap and the Lotion. I'll say as a disclaimer that I am not a huge eye cream fan, although as I am rapidly aging I should probably be using one regularly. I am just not convinced they actually do much, although I have noticed that regular creams can be comedogenic around my eyes, whereas eye creams don't usually have this effect. It's a pleasant hybrid of a cream and a gel, spreads easily, doesn't feel too greasy, and absorbs reasonably well considering that it's a cream. The first thing to note about this cream is the scent! It actually smells fermented, in a very lovely wine-like way. 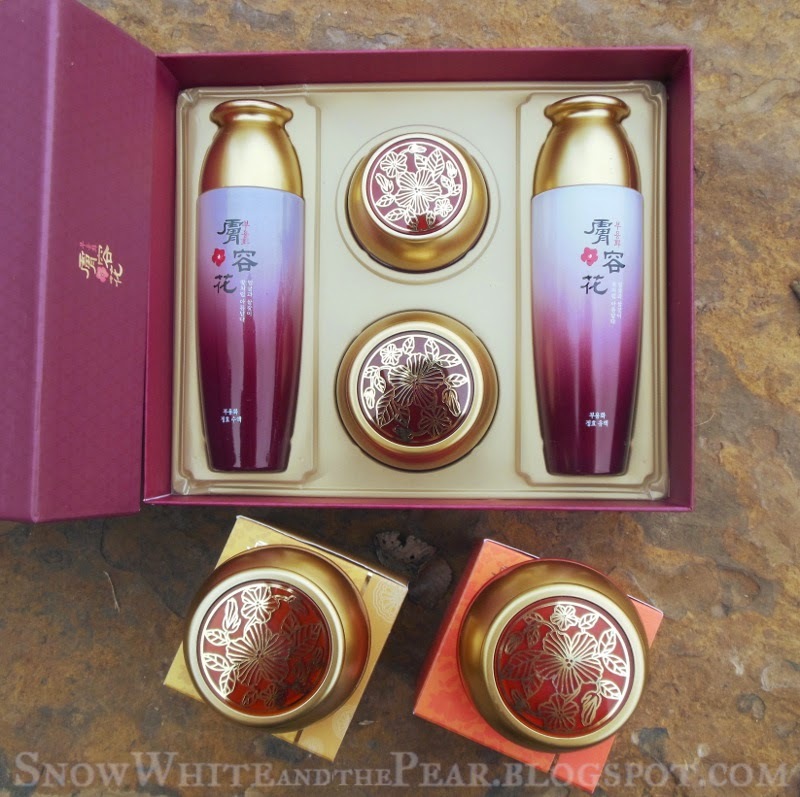 It has a very nice lightly herbal/floral scent that isn't artificial, so of all the products, this is the one that actually smells like it's made with the constantly-repeated "Excellent harmony with skin from 15 kinds of fermented herbal extracts!" selling point blazoned all over the product copy, advertisements, and info card. At first, I was really underwhelmed with this cream, as it was richer than I was used to and left the oily areas of my skin stewing in a disgusting goo of residue, sebum, and piling product by the end of the day. So, I switched up how I used it and started using a very small amount only on the ultra dry or flakey areas of my face, and it quickly became my favourite product of the set. It's a nice, pleasant cream, although the main selling point really is the wine-from-herbs-and-flowers scent that it has. If I did not have other creams that I am super excited to test, I would continue using this. As it is, I am glad that I am decanting it to send off, because I don't want it to go to waste. As I learned more about the products, I realized that this 'cream' is really more of a sleeping pack than a cream that can be used either day or night. You could use it during the day, but it does leave a bit of that 'silicone occlusive' sort of film on the skin after it absorbs that would not play well with sunscreen or makeup. As you may know, I have a pretty rigorous and systematic tracking system and testing schedule for products (you can read more about it here), but everything other than a patch test went out the window when I started this cream. The reason? My face hurt. We had hit an ultra-dry-and-cold patch of winter (and I already live in the desert) and when temperatures were hitting below freezing, the central heating kicked in. That combination turned my skin so dry that it actually actively hurt all day. Desperate time, desperate measures. Nothing I had was working, so I broke out this set and grabbed the cream. When the patch test didn't cause a reaction, I slathered my face with it and almost cried in relief as it started to cool and sooth my angry, flaky, dry face. I've never experienced anything like that before, although I have heard of people's hands becoming so dry they hurt. It was miserable. At that point, my testing schedule was already in ruins so I figured "in for a penny, in for a pound", why not just experiment with the whole line, especially since we were in for more cold, dry weather. As I mentioned in last weeks post, I had been avoiding opening this one because I thought it was an alternate sleeping pack and I already liked the Cynanchum wilfordii Vitality cream so it didn't make sense to have two of the same type open at the same time. Of course, when I finally translated the info card, I realized that despite being named a Pomegranate Pack, it was actually a wash-off mask. The Vitality 'cream' is a sleeping pack, and the Pomegranate 'pack' is a wash-off mask. Sigh. Ah well, it wouldn't be the first time something was lost in translation. Translating is hard! When I opened it, I was astonished to see that it was a clear jelly with little pink blobs and vaguely plant-ish bits suspended in it. I was expecting something more ... Hanbang, less Etude House? Definitely a surprise! I have tested this a few times since I opened it, and despite not being a wash-off mask fan, I liked it well enough. It reduced redness a bit and was lightly hydrating on my face; I know some people really love wash-off masks over sheet masks, but I think my climate or my water just isn't suited to something that needs to be washed off. It does leave a noticeable moisturization to the skin, however, because after I wash it off, my skin doesn't dry out in seconds and turn flakey like it normally does after rinsing. It wouldn't be me without some pH testing, right? I used strips for this instead of my digital pH meter, as these products contain a lot of fats/oils, which don't play well with pH tester electrodes. The results can only be an approximation as the pH strips work by testing the aqueous solution suspended in the product, and as I mentioned these creams include a lot of fats/oils which have an unknown impact on the results. The topmost strip is the Sap, which was around 5.5, and the highest of the lot. The rest are pretty solidly between ph 5 and 5.5, so right in the 'golden zone' for healthy skin. The small variations that you see in the image have to do with the strip drying out and losing colour as a result, but when I tested each, they were all in the pH 5-5.5 range. It's hard to tell what the consistency of a product is when the photos show it still in the jar, so I have 'swatched' them here, in the order they are applied. Sap: you can see this only faintly, as I mentioned it's completely clear and thicker than water, but still very thin and runny. Lotion: You can see how it flows easily as I had applied it second to last but it still dripped down my arm by the time I applied the Sap, but that it's still quite thick and sort of stringy. 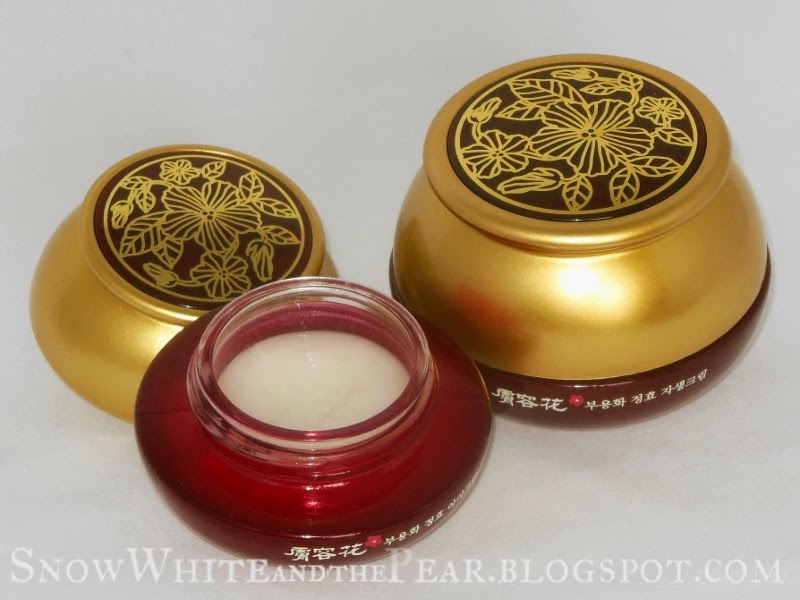 Wild herb/flower cream: A standard thick cream texture. Eye cream: See how it's sort of between a gel and a cream? It's rich without being heavy. Strange texture, but pleasant. 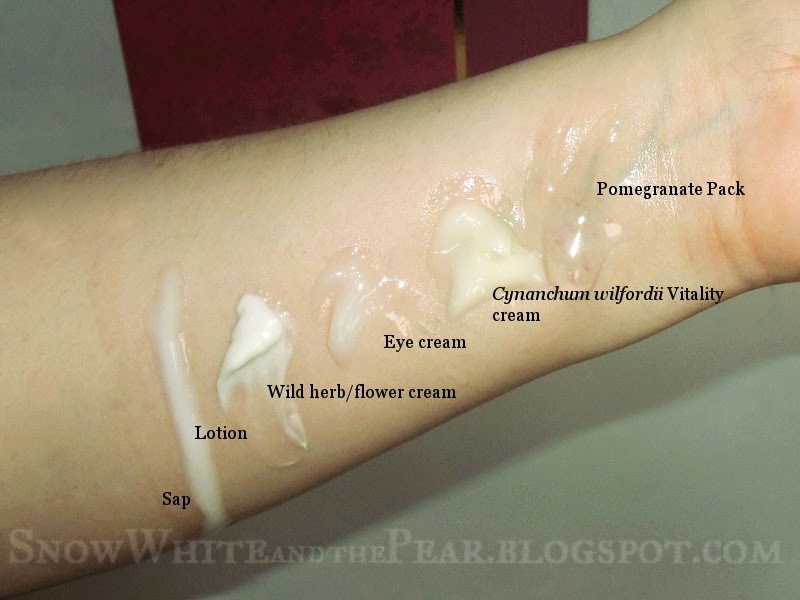 Cynanchum wilfordii Vitality cream: The sleeping pack consistency is more apparent when compared to the Wild herb/flower cream; you can see it 'melting' into my skin a bit. Pomegranate pack: See the pink blobs suspended in the jelly? 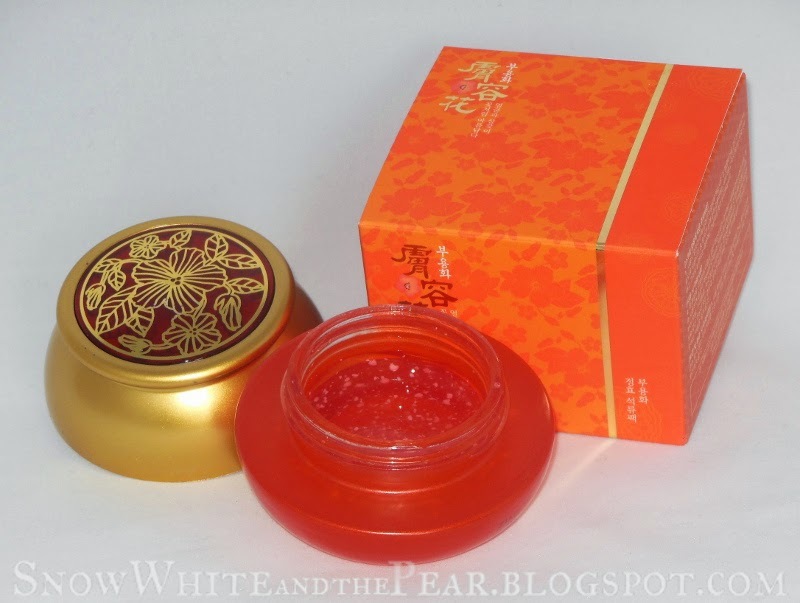 It does spread easily on the skin and does melt in a bit when applied. The pink bits do not break down easily, even when rubbed hard on the back of my hand, so I'm unclear as to their purpose. So, would I recommend any of these products for purchase? Honestly, no. 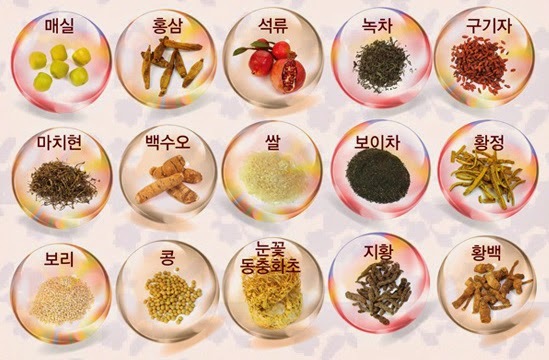 The stand outs from the bunch were the Wild herb/flower cream, which is a standard cream that has a special scent, and the Cynanchum wilfordii Vitality cream, which is a nice product but contains a type of pigment that has nebulous safety. That isn't to say that I regret my purchase, because I paid around $25 for the whole set, marked down from $120 due to the holiday flash sale, and I definitely got my $25 worth out of it. I enjoyed trying something different with the month-long full set project, researching the ingredients, finding ways to translate the Korean, and finding ways to adjust the application of the products to make them work for me. As for the impact on my skin, they did not break me out or irritate my skin, although I did have to use them sparingly to avoid overwhelming it. The set is aimed at mature, dry skin, whereas mine is acne-prone and onset aging, so that's not the set's fault. If it was not for the strong fragrance, I would consider passing this onto my mother, as it matches her skin type and would probably work better for her. Also, the product copy claims that it helps reduce redness and flushing due to hot flashes, and not being someone who gets hot flashes, I really can't comment on that aspect! 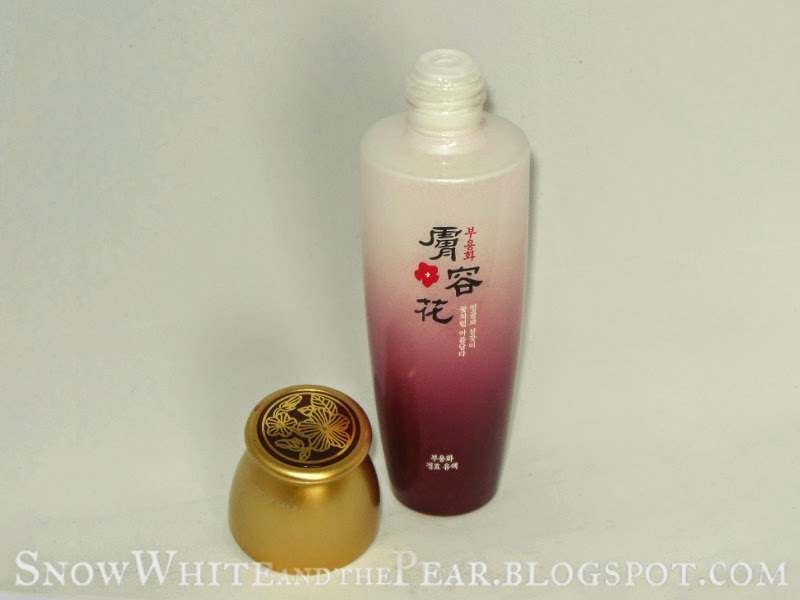 I can say that it was fairly soothing, and the Cynanchum wilfordii Vitality cream is especially soothing. It really feels nice on the skin and rescued my face from the tyranny of winter; it's a shame that it has that pigment in it. At the end of it all. I have a beautiful set of jars to decant expensive product samples into, once I decant the current contents and send them off to the interested parties, and the gorgeous packaging is definitely one of the highlights of the set. I set my expectations at the time of purchase that worst came to worst, I would have a set of pretty jars, and I got that + a month-long adventure so I'd call that a win!